Beach condo rentals offer the ideal mix of comfort, location and romance for a quick getaway to enjoy the last of the summer sun before autumn begins. If you’re thinking of getting away to the Central Oregon Coast through October, there are many beach house rentals to choose from. 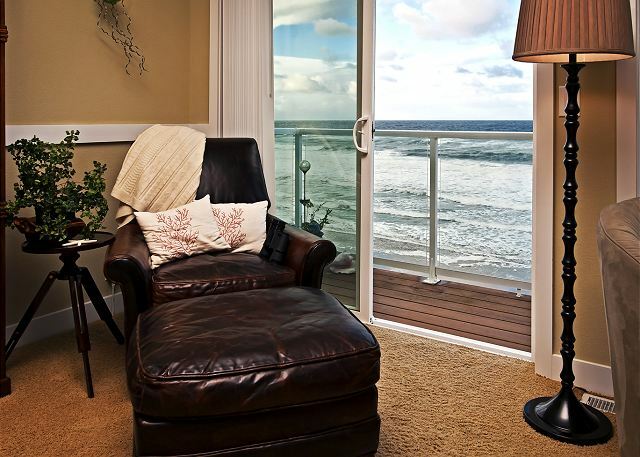 A-1 Beach Rentals still has several available bookings for the coziest and most luxurious condo rentals – as well as larger properties – in the best locations along the coast of Lincoln City, Oregon. There are even deals to be had, including on the restored 1927 property with hot tub known as the ‘Nantucket’ cottage. Keep reading to learn more about beach condo rentals in Lincoln City and book your romantic getaway today! One of the best things about Lincoln City as a location is the close proximity of the ocean to many of the city’s best beach vacation rentals. Oregon beaches are among the most beautiful in the world and offer exceptional sunsets as well as endless activities including beach walking, beachcombing, boating, boogie boarding, crabbing, fishing, surfing and swimming. It’s a great place for all sorts of couples to get away from it all, as there is something for everyone in this charming town. Local entertainment includes a world-class casino, craft shopping, hiking trails and wildlife viewing areas, golf and spa at the Salishan Resort, a historic lighthouse, miniature golf, movie house, museums, theatre and skate park. There are also a number of excellent restaurants, bars, cafes and even a culinary center offering cooking courses complete with a meal and wine. And speaking of wine – several world-renowned wineries are only a short drive away. 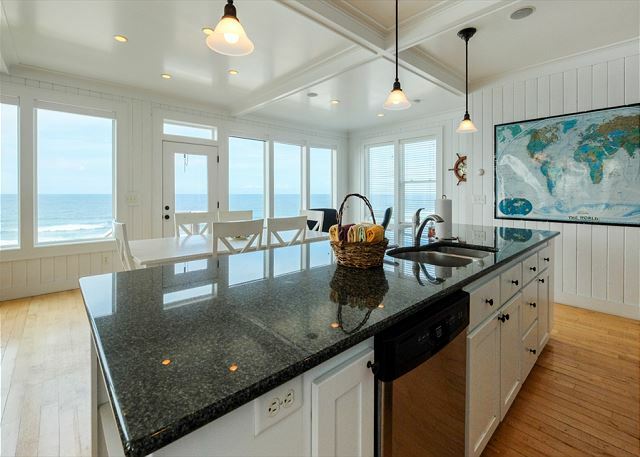 The Nantucket is an excellent example of what a romantic beach condo rental can and should be. It is the epitome of quaint and cozy, with its original wainscoting walls, crisp white trim, a handcrafted wood fireplace, comfy furnishings for two and beautiful French doors that lead you to a wooden deck offering a hot tub and lovely atmosphere. There is even a second deck to soak in some rays or observe the ocean from matching patio chairs. Quaint and cozy doesn’t have to mean rustic or roughing it, though. This cute cottage comes equipped with cable television, DVD player, VCR, movies, stereo and WIFI to keep you entertained, as well as a full kitchen with coffee maker, cookware, microwave, oven, refrigerator, stove, toaster and utensils. Other perks include fresh linens, washer/dryer, private yard with its own walkway and nearby amenities such as a fitness center, library, playground, medical services, ATM, FedEx and outlet shopping. Whether you are the kind of couple who enjoys adventure in the great outdoors, or if sunbathing by day and putting your feet up near the fire by night is more your style, a condo rental in Lincoln City can give you the perfect home-from-home or home-base for a weekend away. You can be right on the beach, close to mountainous hiking trails or in the heart of the downtown’s delightful shops and tasty restaurants. Contact A-1 Beach Rentals today to learn more about the available condo rentals and activities in Lincoln City, and book your romantic getaway today! With the right beach house rentals, Lincoln City, Oregon can be the perfect place to spend Labor Day weekend with the whole family. Many people consider this long weekend the unofficial end of summer and one last excuse to barbeque and celebrate the sunshine. For kids who’ve recently returned to school, the festive feeling of Labor Day also helps ease the transition back into early morning wakeups and homework assignments. If a weekend away for Labor Day sounds like a plan for you, A-1 Beach Rentals can help you find the right beach vacation rentals. Lincoln City and its exciting calendar of events will do the rest! 60 Works in 60 Days – The latest show at Lincoln City Cultural Center’s Chessman Gallery runs from August 10 to September 10, with local artists Katia Kyte (oils) and Joanne Daschel (glass & stone mosaics) each creating one small piece every day. Cruise the Coast – The main street in Lincoln City is transferred into a 7-mile “cruise scene” with music and car shows from August 24 to September 15. ‘Sylvia’ at Theatre West – Escape from reality with live theatre at 7:30 pm on Thursday, August 30 and Friday, August 31. The latest play on at Lincoln City’s Theatre West centers on a man who finds a dog in the park with the name “Sylvia” on her tag, which comes as a welcome surprise for him but a is seen as a cause for jealousy by his wife. Live Music All Weekend – Country/rock band Rock & Roll Cowboys play live at Chinook Winds Casino’s Seafood Grill from 8pm-midnight on Friday, August 31 and Saturday, September 1. Rusty Truck Brewing also features lively acts throughout the weekend. Syco Bill’s String Band are on at 9 pm on August 31, Hippie Love Slave perform electric blues at 9 pm on September 1 and Billy D & the Hoodoos play at 8 pm on September 2. Italian Cooking Class – If you’re interested in learning how to prepare fall-inspired Italian food from scratch, you’ll want to book your spot at this hands-on cooking class at Lincoln City’s Culinary Center from 11am-2pm on Saturday, September 1. The $75 fee includes lessons from a renowned chef followed by a delicious meal and wine. Free Fishing Weekend – Oregon residents and visitors will be treated to a full weekend of free crabbing, clamming and fishing without a license on Saturday, September 1 and Sunday, September 2 complements of the Oregon Department of Fish & Wildlife. Summer Morning Matinee – Lincoln City’s Bijou Theatre wraps up its popular Sunday Morning Matinee series with the beloved animated classic ‘All Dogs Go To Heaven” on Saturday, September 1 and Sunday, September 2 at 11 am. Farmers & Crafters Market – Lincoln City’s Cultural Center comes alive with its outdoor Farmers & Crafters Market from 9 am to 3 pm on Sunday, September 2, featuring nothing but handmade and homegrown items. For more information about the above activities and events, visit the Oregon Coast website’s Lincoln City events calendar. Whether you choose a larger rental home or one of our cozy beach condo rentals, Lincoln City is perfectly positioned for fun in the sun thanks to its 7½ miles of pristine beaches. The whole family can enjoy beach walks, building sandcastles, swimming in the ocean or sunbathing, and then head back for barbecuing or even some time in the hot tub. So don’t waste time. Contact A-1 Beach Rentals to book your perfect Labor Day beach rental today! Whether you live nearby or are staying in one of our beach house rentals, Lincoln City, Oregon is the place to be this 4th of July. The city will be buzzing in the days leading up to Independence Day and everyone can find a whole range of events, activities, and pastimes to make the most of the celebrations. From tiny tots to great-grandparents, there’s something for everyone just a hop, skip or jump away from each of our beach vacation rentals. Lincoln City is an ideal spot to find yourself on America’s birthday – so how will you make the most of it? Here are a few suggestions to make your 4th in Lincoln City as fun and festive as can be. Yacoov Bergman, the Artistic Director of the Siletz Bay Music Festival, has curated a wonderful 2-week program of chamber, vocals, big band and full orchestra music from June 20th to July 4th. Many performances will take place at the Lincoln City Cultural Center, but a variety of music events will be hosted at other venues around Lincoln City as well. It all culminates with the “Sweet Land of Liberty” Festival Orchestra at Salishan Spa and Golf Resort on the 4th of July. If you’re in Lincoln City with the kids the weekend before the 4th and you’re wondering what to do, why not take them to Pixie Fest at Chinook Winds Casino Resort? There will be rides, games, food, entertainment, and fun for the whole family from 11 am to 7 pm on Saturday, June 30th and noon to 5 pm on Sunday, July 1st. Make sure to get up early on the 4th of July and head to Gleneden Beach Community Club at 110 Azela Street for the annual Pancake Breakfast from 8 am to 11am. You can get your fill of ham, sausage, eggs, pancakes and all the fixings for $6 (adults) or $3 (kids 4-10). Children under 4 years old even eat for free. After breakfast, you can keep the whole family entertained at the Gleneden Beach Craft Fair and Food Court from 10 am – 3 pm. Just head to the Eden Hall at 6675 Gleneden Beach Loop Road for all sorts of vendors, arts & crafts, food, music and more. 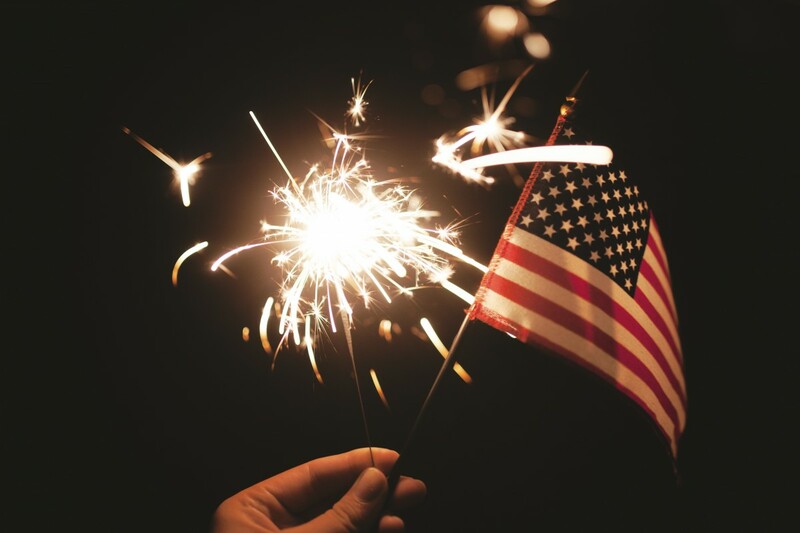 Some people say that Independence Day wouldn’t be complete without a parade, and if you tend to agree then you will need to find yourself at Gleneden Beach when Lincoln City’s annual 4th of July parade starts at 1 pm. Parking at the beach will be limited, so plan accordingly and remember to find a copy of the parade map online beforehand to pick your perfect spot to spectate. There will also be a variety of live music acts playing in the historic Taft District of Lincoln City from 1 pm to 9 pm on the 4th of July. The acts are still to be announced, so stay tuned and check the OregonCoast.org website for more information leading up to the day. To cap things off, Lincoln City will be dazzled by a captivating display of fireworks over Siletz Bay in the Taft District after dusk, from about 10-10:30 pm. Save your energy, because this display will be magical and worth the wait. When it’s all said and done, you’ll be ready to head back to your homes or beach condo rentals. Lincoln City will still be alive with that festive spirit once the 4th of July is over, though, so keep A-1 Beach Rentals in mind for all your summer fun right on through to Labor Day! Seabird Cottage Beach House Available for Last-Minute Summer Guests! Thanks to an unexpected cancellation, one of the most sought-after beach house rentals in the idyllic seaside town of Lincoln City, Oregon is suddenly available from the 8th to the 21st of July with a required two-night minimum stay. 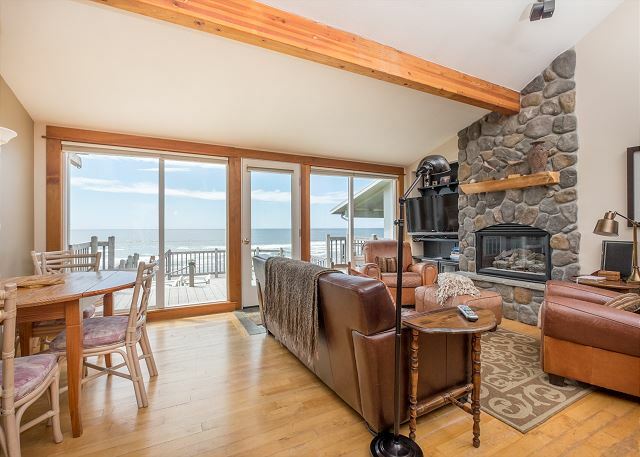 Rentals like Seabird Cottage are typically booked up months in advance for the summer, but you can now book this stunning beachfront property on the Central Oregon Coast at the last minute. 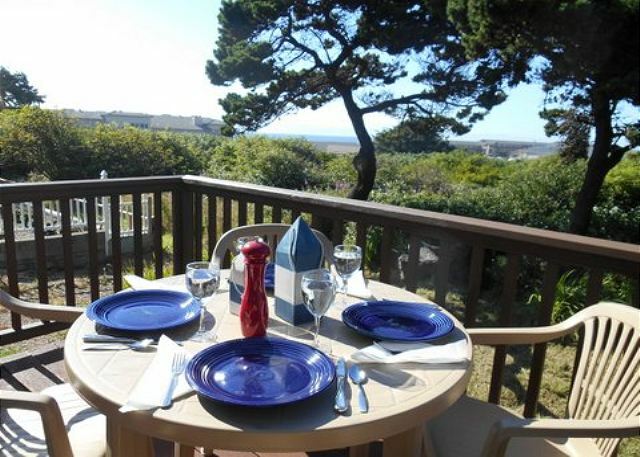 Thinking of getting away next month to one of our best Lincoln City beach vacation rentals? Oregon has so much to offer this time of year, from the ocean and rivers to the forests and mountains to the fine dining and fine wine – but you will need to act fast if you want to enjoy it! Keep reading to learn more about this unbelievable property and what you can expect when vacationing on the Central Oregon Coast. This elegant cottage also features custom trim throughout the property, hardwood floors and tongue-and-groove wooden white walls that add to the overall sense of sophistication. In addition to the bedrooms and bathrooms, Seabird Cottage also features a great room adjoining the gourmet kitchen with granite counters and island, as well as a media room with music center, Wi-Fi, two televisions, DVD player and VCR. You will need to act fast to take advantage of this property’s unanticipated availability in July, though, and make sure to book for at least three nights without any single night gaps. Whether you end up in Seabird Cottage or any of our oceanfront homes and beach condo rentals, you will have your pick of activities in and around Lincoln City. The beach is the most obvious place to go, and if you don’t make it past the sand and surf your vacation can and should still be the making of wonderful memories. Nearby you will also find lovely hiking trails along rivers and up mountains, sought-after wine tasting experiences, a world-class casino, and entertainment center, fantastic shopping at the Lincoln City Outlets and a charming main street with lots to do. That is just the beginning, too. Do your research and ask around, and you will find there are events, cultural opportunities and entertainments to suit virtually anyone and everyone. It will all start to unfold once you’ve booked your beach house rental in Lincoln City, Oregon. Normally, if you wait until the last minute to book your Memorial Day beach vacation rentals, Lincoln City is sure to be out of reach. At least, that’s how it goes most years. If you’re looking for a beautiful oceanfront home for Memorial Day Weekend 2018, though, you’re in luck! Pacific Escape in Lincoln City, Oregon is still available for the upcoming holiday weekend that marks the unofficial start of summer. This 3-bed, 3-bath home is normally booked months in advance, but this year it’s miraculously vacant and you can even take advantage of a $100 discount if you book 3 nights over the Memorial Day weekend. Keep reading to learn more about this amazing property, but don’t wait too long if you’re thinking about booking it! Pacific Escape is truly one of the finest beach house rentals Lincoln City, Oregon has to offer. This property is known for its large, open floor plan and expansive, panoramic views of the Pacific Ocean and Lincoln City’s miles of sandy coastline that can be seen from floor-to-ceiling windows in the kitchen and bedrooms of the home, as well as from the hot tub. This makes it a perfect choice for whale watchers, storm chasers and romantic sunset watchers alike. With the capacity to sleep eight people in two king beds, a queen bed and a queen hide-a-bed (plus plenty of clean linens), there’s also enough room for everyone to comfortably stay at one time. 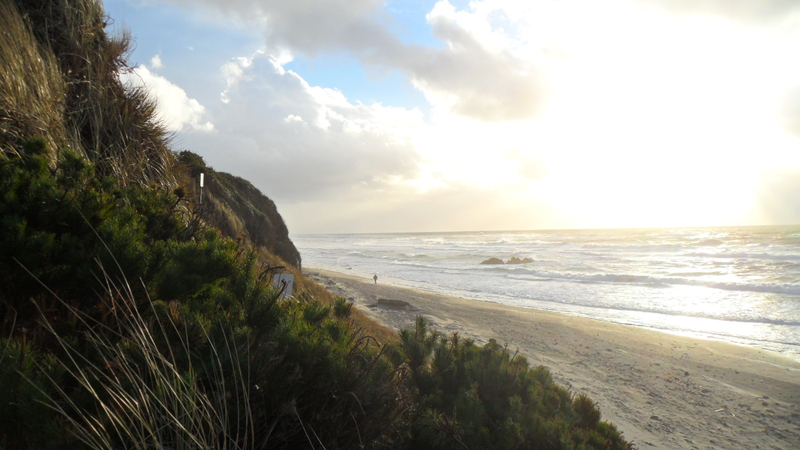 Beach access for beach-combing, fishing, kite-flying, tide-pooling, whale-watching, etc. At this time of year, you would be hard-pressed to find any other comparable beach house or beach condo rentals. 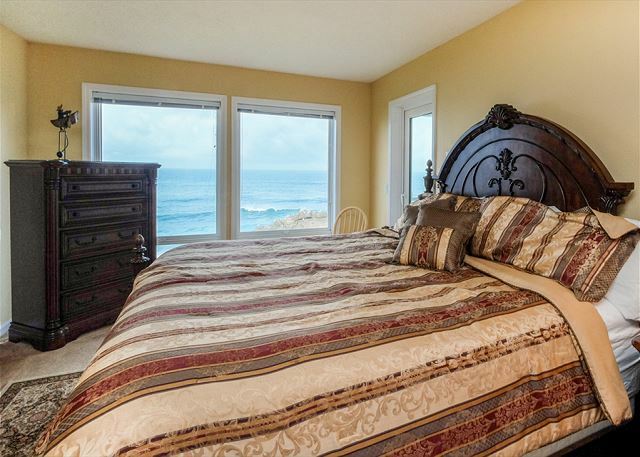 Lincoln City is all booked up – except for this beautiful home that sleeps eight by the sea! Do not hesitate to book now if you are interested in this home. You will not regret the time you spend in Lincoln City, Oregon this summer. With lighter crowds, the last gasps of warm weather and plentiful beach rentals, Lincoln City, Oregon makes an ideal destination for a couples’ getaway this October. Sure, summer is great for family-friendly days in the sand and sea, but once the kids are back in school it’s the perfect time to rekindle some romance. And what a place to remember that spark. Whether you’re a new couple or celebrating decades of marriage, this picturesque coastal town offers something to help you feel the love. Here are a few ideas if you need inspiration. The first step to planning your perfect getaway is to book one of the most romantic beach vacation rentals Oregon has to offer. 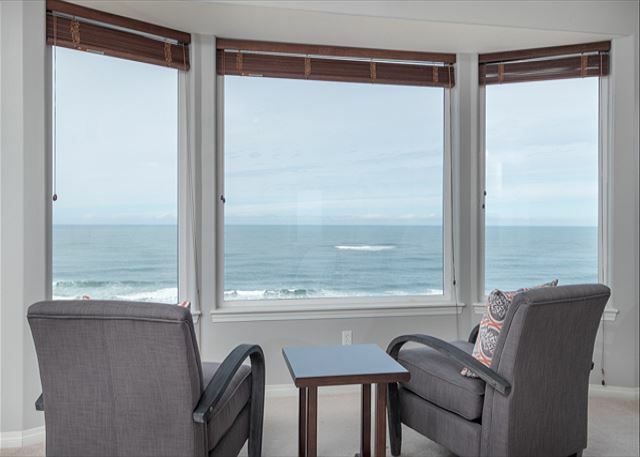 The Miracles vacation rental condominium is a prime example of what you might find in Lincoln City, offering a two-person hot tub with panoramic ocean views and beach access mere steps from the property. When you return from your starry-eyed stroll you will also enjoy amenities such as a wood-burning fireplace and LED electric fireplace, 42” television with DVD player, fully equipped kitchen and BBQ. The comfortable queen mattress topper, ivory leather love seat, pub-style glass topped table at a window overlooking the ocean and other little extras add to the ambiance. Whether you’re looking for a home-base to begin your adventures or just want to enjoy a glass of wine while you watch the sunset, this cozy apartment has you covered. Aside from offering some of the best Oregon beach house rentals along the coast, Lincoln City also boasts a diverse range of activities and environments to suit the wants and needs of virtually any couple. If you’re a rugged sort of couple that lives for the Great Outdoors, there are plenty of parks and trails to enjoy. The Cascade Head Trail, for example, takes hikers through temperate rainforest, up challenging hills and to the top for views of the ocean and rocky coastal terrane. 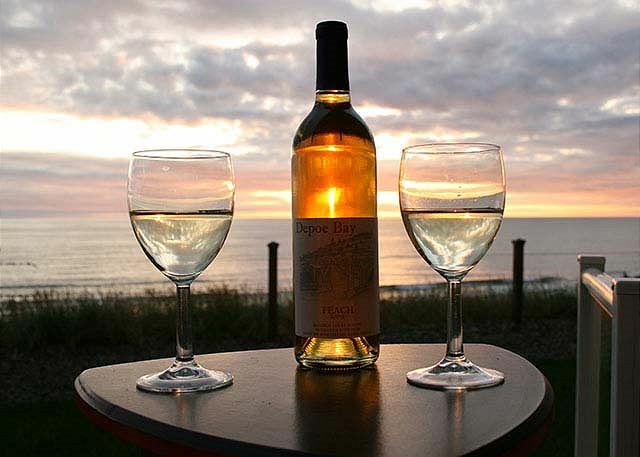 Wine lovers, on the other hand, have plenty of options for wine-tasting such as the Flying Dutchman Winery or the Depoe Bay Winery. And if you’re looking for sumptuous romance at new heights, why not pop a bottle of bubbly while looking down on the world below from a hot air balloon? There are several companies offering hot air balloon rides in and around the area so you can be sure to book an excursion on a day that suits you. There isn’t really a bad time of year to visit Lincoln City, Oregon, but October might just be the perfect month for couples to get away. This idyllic 7½-mile stretch of coastline with an inland area offering everything lovers might want and need reaches its peak of picturesque walks, stunning sunsets and sumptuous local delicacies as the harvest season approaches. So, why not book your beach house or condo today and start planning? 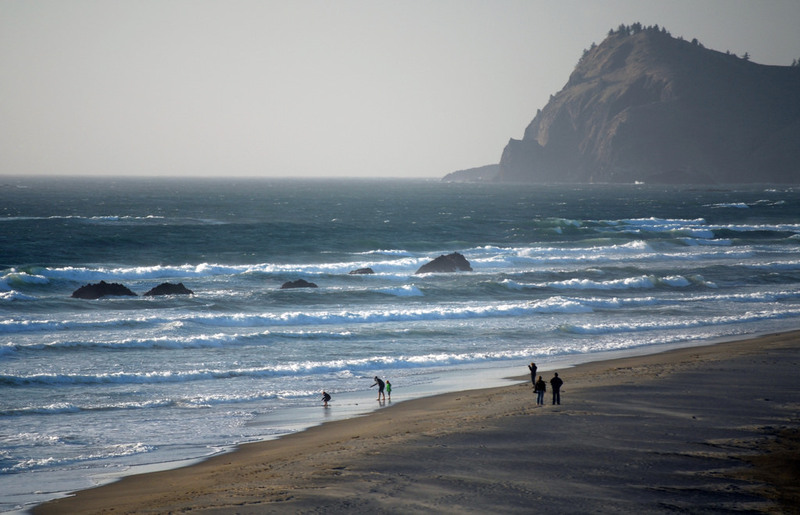 Lincoln City boasts some of the best beach vacation rentals Oregon has to offer, with miles of pristine coastline within walking distance and an array of local treasures to explore during a short stay or a longer getaway. If you’re planning a trip to this beautiful seaside town along the Central Oregon Coast, you can consider yourself lucky! You may also be thinking about all the work that lies ahead in preparing for your vacation, but remember that this is supposed to be a time to relax and have fun. So, follow these simple steps and your packing should be done in no time, so you can sit back and relax as your trip gets underway. 1. Pack according to how long you’re staying. Think about how many shirts and other essential articles of clothing you would normally wear in that period of time, then pack one extra. Most Oregon beach house rentals have laundry facilities on-site, but who wants to spend their vacation doing laundry? Keep it simple but avoid packing every possible thing that you might want to wear. 2. Bring something you’ll feel confident wearing on the beach. Whether you’re wearing board shorts, a one-piece swimsuit or two-piece bikini, you should feel comfortable and confident when you’re enjoying some fun in the sun, sand and waves. Make sure you have some go-to beachwear as well as a casual pair of shorts. Some jeans or sturdy trousers and a light jacket are also a good idea, so you can enjoy walks on the beach later in the evening when it gets cooler. 3. Picture yourself out on the sand. Getting all the way to your vacation home and walking to the ocean with your beach bag, only to realize you’ve forgotten something essential at home, can put a real damper on a sunny seaside day. So, before you take off, imagine that you are at the beach with everyone who will be joining you during your time away. What will you need to have with you? Sunscreen is an obvious one, but also think of whether you’ll want oversized beach towels, water canteens, buckets and spades, windbreakers, beach umbrellas or any other gear you normally use. 4. Pack some first-aid essentials. This is especially important if you are traveling with children. If an accident happens, you’ll be glad you packed those bandages, antibiotic ointments, medicated creams and sunburn-relieving Aloe Vera products. 5. Prepare for the amenities on-hand. Luckily, there are kitchens or kitchenettes in all of A-1’s beach rentals. Lincoln City, Oregon offers a wide range of options for groceries and other conveniences, so you won’t need to pack much in the way of food since you can purchase it all once you arrive. You may want to bring some specialty items to feel more at home, though, and you will definitely want to leave room in your budget for dining out at some of the delectable local restaurants. 6. Keep your paperwork in a safe place. The final step you will want to take before heading off for a stress-free summer break on the Central Oregon Coast is getting all your paperwork in order. If you have printouts of online bookings, rental car paperwork, important medical forms or other critical documents, keep them in a clear plastic bag in a safe place where you will remember it.